♥♥ Listing is for the mold pictured…embellishment or photo props are not included. ♥♥ SIZE……See below or above picture(s) to the right with ruler for size reference PRIOR to purchase to make sure you are not surprised at the size when it arrives. ♥♥ Embellishments pictured are made from clay, fondant, resin, plastic or metal. 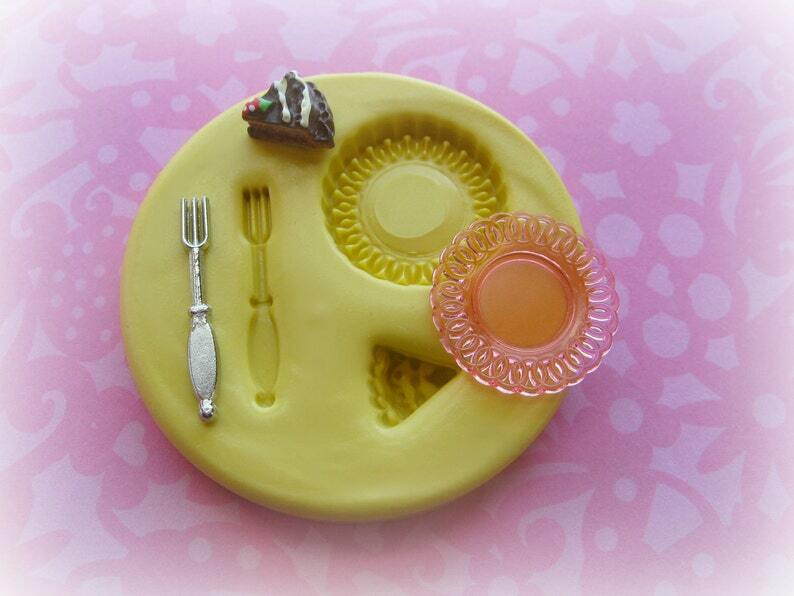 ♥♥ Resin, Fondant, Polymer Clay, Metallic Clay, Glass, Soap, or Wax is typical material used with these molds. Your creativity is what will make your piece unique. ♥♥ "Zoom" in on the picture of your intended mold to see if the mold is smooth inside or has the decorative indentations that you desire. ************Some of the decoration on the embellishment may have been painted, added on or glossed for added enhancement ( i.e. FACIAL Expressions, textures or color). You can achieve the same look by using paint/fine tip marker, glosses, powders or metallic clay to your piece. Some pieces may REQUIRE some creativity by you to achieve the look of the embellishment. You may need to carve, cut, slice, poke holes, paint or otherwise manipulate your piece to achieve the look you want. :) Your creativity is what will make your piece unique. If you are having trouble with a mold and can’t get your piece to come out just right, please send me a note. I may be able to offer suggestions to help fix the problem. ♥♥ IDEA CORNER: These are just ideas for you. You will need to take into account the size of the mold you are buying with regard to what you would like to use if for. This mold is made of non-toxic material and complies with 21CFR 177.2600. You may wash your mold carefully with soap and water. This mold is food grade compliant and will take heat up to 395 degrees F. This enables you to either bake food, polymer clay, or any other type of material in the mold without harming it. Although, clay should not be baked over 275 degrees. ALWAYS follow your clay package instructions. If you plan to use the mold for food, do not use it with any other material before putting your food product into the mold to eliminate any possibility of contamination. Here are a few helpful tips I wanted to pass on to you. 1. You can bake your clay in or out of the mold. 2. Clay should never be baked over 275 degrees or it will burn. 3. I bake my clay pieces for about 4-5 minutes and check for doneness after they cool. 4. If not done, pop it back in the oven for another couple minutes. 5. Press clay into mold and pop in fridge for 15 min. Makes it easier to remove from mold. If you are baking the piece in the mold then skip the fridge part. 6. Glass, paint and decorate your piece after baking not before. 7. You can drill holes with a small bit after your clay piece is baked. 8. You can also sand your piece with a fine piece of sandpaper. 9. I press my clay into the mold, slice off excess clay with a razor blade and then use my finger to pull it away from the edge of the mold to make it a “clean” edge. You may have to slice off more clay and pull it away from the edge a couple of times before it is just right. Most of my molds work wonderfully with fondant. However, deep, thin cuts in the mold may not be as sharp in your final product if you are using fondant. If you have any questions please send me a note prior to purchase. This item is well made! So far I'm loving it. I haven't made the plate yet, but I love how it should turn out. The little cake piece is awesome. Shipping was fast. Great customer service! I didn’t quite like the plate design on one of the molds that I received and the seller sent another out for no extra charge!